On the last day of my boyfriend’s family reunion in northern Maine, we stopped for a lobster roll and then had some time to kill before checking in at the airport. There’s not a whole lot to do in Bangor, so we wandered around the LL Bean outlet store for a while. At the “impulse buy” shelves by the register, I found a box of recipe cards: “Farm Fresh Meals: 50 Delicious Recipes for Every Season” from Moosewood Restaurant, which I had to buy. Inside, each recipe is on its own card, organized by season, so you can just pull the card out and take it to the grocery store. Genius. It didn’t take me long to put it to use. We were invited to a friend’s place for dinner last night, so I decided to go through the “Summer” section and make a dessert. Since peaches are abundant right now, I made the Navajo Peach Crumble. What makes it Navajo? Well, that’s not explicitly explained in the recipe, but it does mention that cornmeal and pine nuts, two of the ingredients, are staples of the southwestern U.S. Anyway, this is super simple to prepare. In a bowl, combine 1/2 cup unbleached white flour, 1/3 cup cornmeal, 1/3 cup sugar, and 1/8 tsp salt. Using two knives, cut in 6 tbs butter until coarse crumbs form (you might have to use your fingers at the end to roll it). Then add 1 tbs toasted pine nuts (optional). In a separate bowl, combine 3 cups peeled and sliced peaches, 1/3 cup sugar, 1 tbs lemon juice, and 1/2 tsp cinnamon. 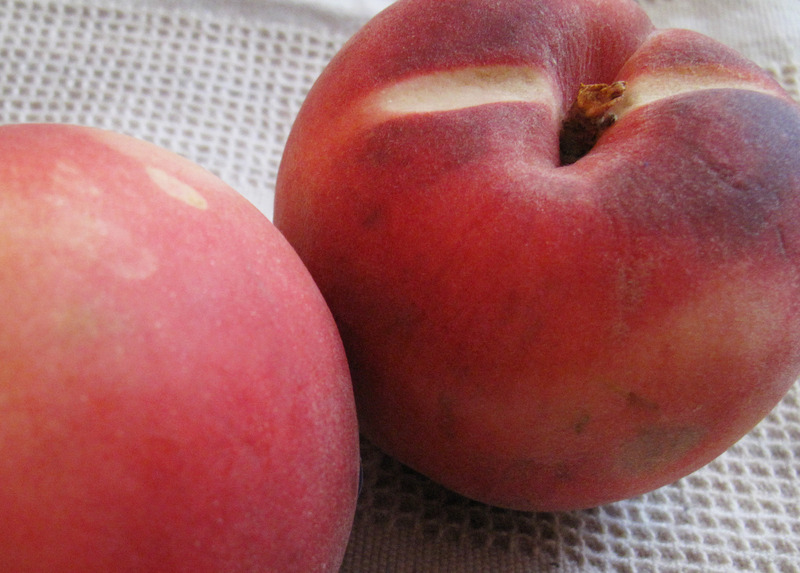 I found these giant white California peaches, and ended up using three of them, which was a little more than three cups. I also added extra lemon juice because I thought the tartness of the white peaches would be less than regular peaches. 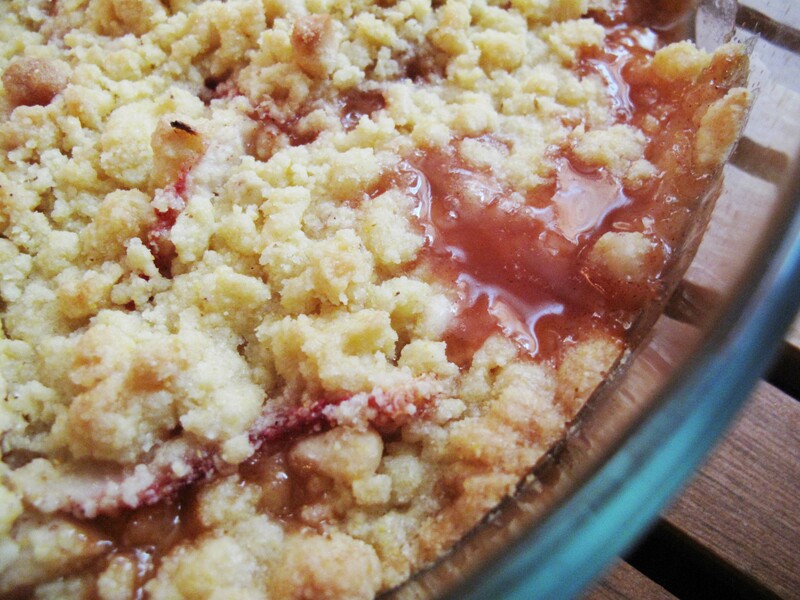 Spread the peach mixture into a round 9 or 10 inch pie pan and sprinkle the topping over it. Bake at 375 for about 30 minutes. We served it with butter pecan Haagen Dazs. Deeeeee-licious.